I was invited to attend the event as media. The weather outside is turning frightful. Okay, today ended up being close to 70 but when we left for school this morning it was in the 40s. That is frightful in my eyes. And what is more frightful is knowing that the cold weather brings with it all types of cooties. JustaBXgirl doesn’t get sick often. I’m hoping that doesn’t change now that she’s in school. Either way, though I am preparing myself with A Little More Wisdom from Little Remedies. Recently, I spent the morning having breakfast, getting a manicure and learning tips on keeping the family healthy from Dr. Sue. Now I’m here to share some of the information with you, straight from the source! 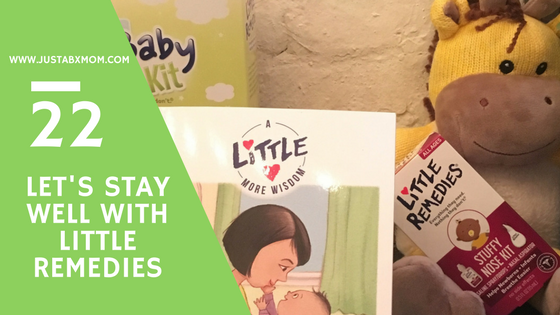 A Little More Wisdom is a parenting resource for caring for your baby’s health and wellness, from day one. The book debuted in October and was written by Jennifer Bright Reich and illustrated by Laura Zarrin, with medical expertise by Dr. Sue Hubbard. A Little More Wisdom offers wisdom from moms to help navigate some of the small bumps in the road of motherhood with the very best parenting tips, advice and health and wellness inspiration from the best experts. From crying to colds, tummy troubles to traveling, the book provides insights for some of the most common situations related to your baby’s health and wellness. The book also includes tips from dozens of moms across the U.S.
As a new parent, it’s sometimes easy to feel nervous or overwhelmed. Founded by a father and a pharmacist, Little Remedies® understands that parents are looking for safe and reliable ways to keep their baby happy and healthy – whether that comes in the form of tried-and-true tips, or products made with only the most necessary ingredients, and no artificial flavors, dyes or parabens. A Little More Wisdom was created with this understanding in mind – including the very best tips, parenting advice, and health and wellness information, gathered from some of the very best experts working today. Our hope is that the book will help new parents navigate some of the most common situations that they will face when caring for their baby – from crying to colds or tummy troubles to travel – and serve as a reminder that they are not alone. Yes this weather has me LoCa. Love Lil remedies. Is Screentime A Bad Thing?